I am really excited to announce that the long awaited new version of ReaderSvg has been released. Previous versions of Ab2d.ReaderSvg returned the read svg files as Shapes (Path, Polyline, Ellipse, etc.). This was great when you needed to manipulate separate objects or add some mouse events to objects. The flexibility of Shapes has its cost when complex objects are shown - the performance could be very poor and memory consumption very high. 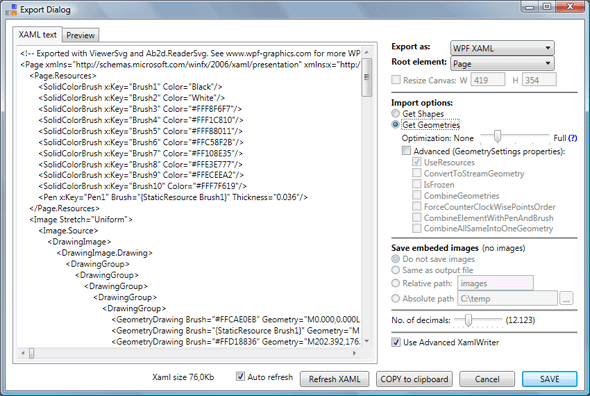 WPF provides a much more efficient way to show more complex images - by using Drawing objects instead of Shapes. With the new Ab2d.ReaderSvg it is possible to read the objects as Shapes (with the Read method) or as Drawings (with the new ReadGeometry method). And what is more, it is also possible to further optimize the drawing by using resources for similar Pens and Brushes and by combining geometries together (with passing the GeometrySettings to ReadGeometry method). The support for Drawing objects is just one of the improvements of the new version. Another very big improvement is much better performance of ReaderSvg - now reading svg files is almost as fast as parsing xaml with XamlReader. new ReadGeometry method with support for advanced geometry optimization and use of resources (Burshes and Pens are defined in resources). Greatly improved performance on svg files where path elements have a lot of segments. Added support for known colors in xaml writter - known colors like Black, Yellow can now be written with its name instead of hex display (#FF000000). This feature is used by default but can be disabled with setting UseColorNames in XamlWriterSettings to false. The path is now automatically closed when the last segment ends on the same position as the start segment. Before if the paths were not manually closed, there could be some sharp edges on some parts of the path. Improved setting the size of returned Viewbox. If AutoSize is false the returned Viewbox has the size that is defined in the svg file. The previous version did not set the size correctly. 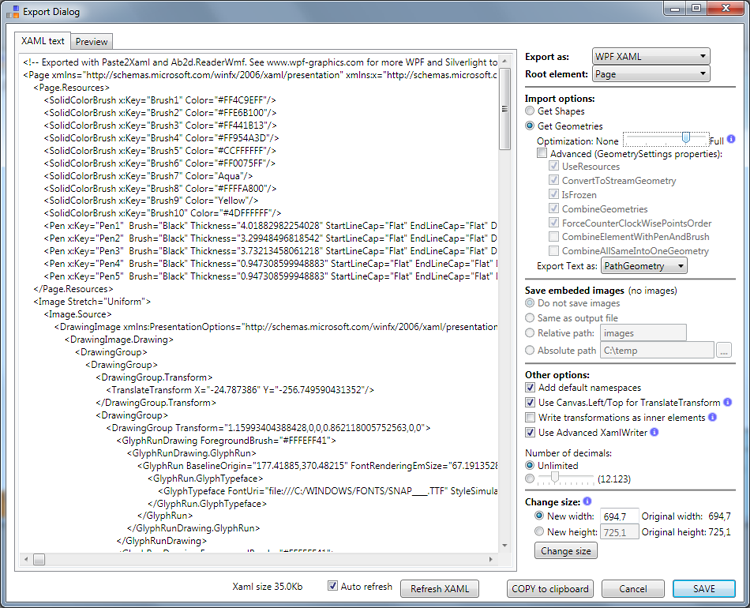 If the svg width and height are specified in cm, mm or inches the output size in xaml is set in cm. Added ReadPathAsPathGeometry property - If false (default) the path is read as StreamGeometry (better performance). If true the path is read as PathGeometry (worse performance but path can be modified). Another change is that by default all paths are now read as StreamGeometry (before they were read as PathGeometry). 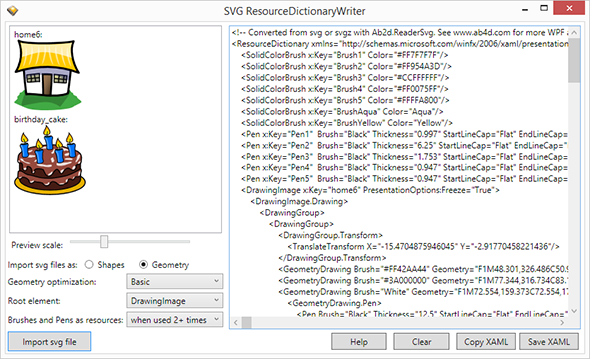 This greatly improves the performance of reading svg file and drawing objects in WPF. But if your code expects the PathGeometry, the default behavior would throw a runtime exception. To avoid this, you can change your code to support StreamGeometry or set the new ReadPathAsPathGeometry property on ReaderSvg to true.